Summary (from Goodreads): A 17-year-old Moldovan girl whose parents have been killed is brought to the United States to work as a slave for a family in Los Angeles. Imagine someone convinces you to go to another country. Not to travel. Not for school. But a promise of a better life. You are told you would be making at least double your current salary. Your new job is a nanny to two young children. Sounds semi-decent, right? Unfortunately, this is one of those times when things are not as they seem. Welcome to your new life. You are now a slave. Along with taking care of the two children you're also expected to clean the entire house daily. If you don't get something done there are consequences. Harsh ones. Oh, and that nice paycheck you were expecting. Forget about it. You'll never see a dime. Your employers claim you must pay off your plane ticket, passport and all travel related expenses first. That'll take at least a year and along the way they'll keep adding additional "charges" so you'll never get paid. This is only the tip of the iceberg. Things will get much, much worse for you. Welcome to seventeen year old Hannah's life. Her story is a scary one. One that is a real-life nightmare for far too many teenage girls. This book kept me on the edge of my seat. It was heartbreaking to read Hannah's story but I had to keep reading to find out what happens to Hannah. She is literally trapped. She's not allowed to leave the house or even make a phone call to her family. That's how the abuse started but got worse as time went on. 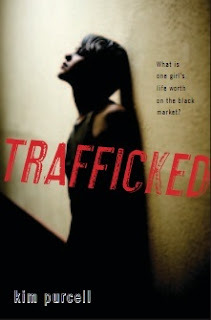 "Trafficked" is Kim Purcell's debut novel. I think Purcell did an amazing job portraying the horrible conditions Hannah was subject to without going into overly graphic detail. This is not a "feel-good" book. You won't feel all warm and fuzzy inside reading it. Considering the subject matter, you shouldn't. I love when books (even fiction books) teach me something. I learned that Moldova is a real country located in Eastern Europe and that unfortunately human trafficking an issue that still exists in our world today. After I finished reading "Trafficked", I started doing my own research about human trafficking and domestic slavery. It's a much bigger epidemic than I ever realized. I'm glad this book is bringing awareness to it. Purcell has a page on her website that has ideas on how to help teenagers who are victims of human trafficking. You can find that here. Great review - I also read this and liked it very much. And bravo to the author for calling attention to the problem of human trafficking of young girls. Ooooh this sounds intense, and so relevant! I have seen another review for this recently and definately want to pick it up, I think its important to raise awareness of this issue. Yes! You should definitely get a hold of this book! I read a nonfiction book a few years ago about this exact situation and it sounds like Purcell did an excellent job making human trafficking accessible to the fiction reader. I definitely want to read this one soon. Heather, do you remember the title of the nonfiction book?